The Danish Cheer Committee of the Danish Lutheran Church cordially invites you to celebrate its 83nd Anniversary and its Annual Christmas Party on Saturday, December 5th, 2015 inside the Tom & Valley Knudsen Cultural Center at The Danish Lutheran Church, 16881 Bastanchury Road, Yorba Linda, California 92886. The event starts at 5:00 pm with a Bilingual Church Service led by Pastor Anne-Grethe Krogh Nielsen. At 6:30 pm, the Traditional Danish Christmas Dinner, catered by Max Christensen, is served. 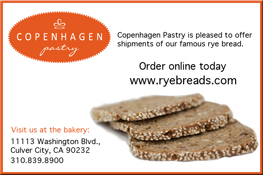 Please mail to The Danish Cheer Committee c/o Danish Lutheran Church, 16881 Bastanchury Road, Yorba Linda, CA 92886. For further information, please call the Danish Church, (714) 993-6362.